SURFACE provides a full range of tips for MTS/Agilent nanoindenters as well as for Hysitron indenters. Check our web shop for a comprehensive list of available tips. We can also supply conductive diamond tips as well as sapphire tips. Please contact us for more information. 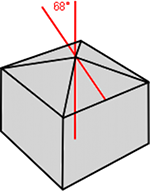 The Berkovich tip is a three-sided pyramid. 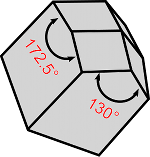 The angle between the centerline and the three faces is 65.3°. The three face design allows to grind the tip to a sharp point. It is suitable for bulk materials, thin films, polymers, scratch testing, wear testing, MEMS, and imaging. 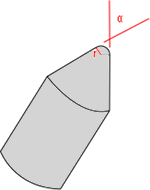 The Vickers tip is a four-sided pyramid with an centerline-to-face angle of 68°. It is suitable for bulk materials, films and foils, scratch testing, and wear testing. Originally developed in the 1930s for hardness tests, this tip has a rhombic-based pyramidal shape that forms an elongated diamond shaped indent. Due to the elongated shape, the diagonal of the indent can be measured to determine the size/depth of the indentation. 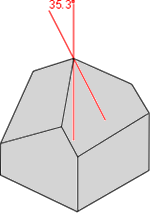 As the name implies, this is a three-sided pyramidal tip with perpendicular faces like the corner of a cube. 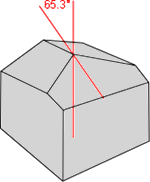 The centerline-to-face angle is 35.3°. It is suitable for thin film, scratch testing, fracture toughness, wear testing, MEMS, and imaging. The conical tip is characterized by its cone angle α and the radius of the tip curvature r. Cone angles between 45° and 120° are available. The tip radius can vary between sharp (<1 μm) and 100 μm. The simplicity of its cylindrical symmetry makes it attractive from a modeling standpoint. It is suitable for scratch testing, wear testing, imaging, and MEMS applications. This tip is similar to the conical tip, but instead of a rounded end it has a flat surface. It is characterized by its cone angle α and the diameter d of the flattened tip. 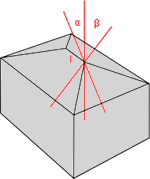 Cone angles between 40° and 90° are available. The diameter can vary between 2 μm and 250 μm. This shape is similar to a four sided pyramid that is elongated in one direction. It can have two different centerline-to-face angles. It is characterized by the two angles between opposite faces, and the length of the wedge.